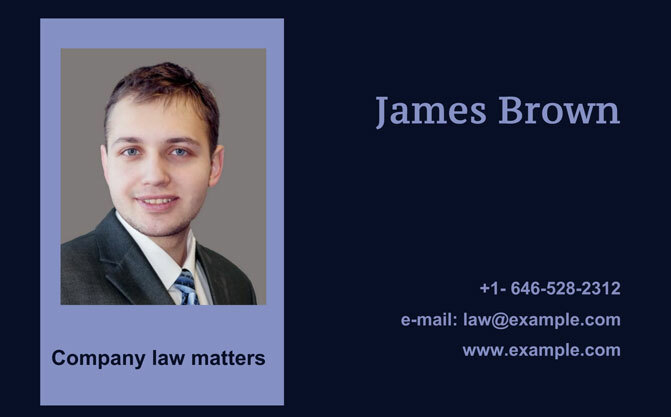 A lawyer's business card is the most effective promotional tool that one can have beside good reputation and satisfied clients. Anytime you meet new people, you can offer them your card and thus expand your customer base and attract new profitable cases. Just imagine that thanks to one small piece of paper you can have enough clients to provide for your family and to hire an assistant to help you with extra work! It should convince the recipient that you are a reliable expert of your field. The design of your card must be remarkable and elegant. The card should mirror the field you specialize in. A bankruptcy lawyer and a family & divorce lawyer shouldn't use the same designs. Your business card should contain all your contact information and necessary details to show that you are always ready to help and your motto is to be as useful to people as you possibly can. Before you start checking out the lawyer's business card ideas listed below, you need to choose the way you are going to get your card. Of course, you can always hire a designer who will make a card for you. But are you sure that they will find a way to showcase your ideas? Your business card is a professional tool, and an ineffectual design may become a huge reputation problem for you in the future. Luckily, today you do not have to be a designer to create a business card. 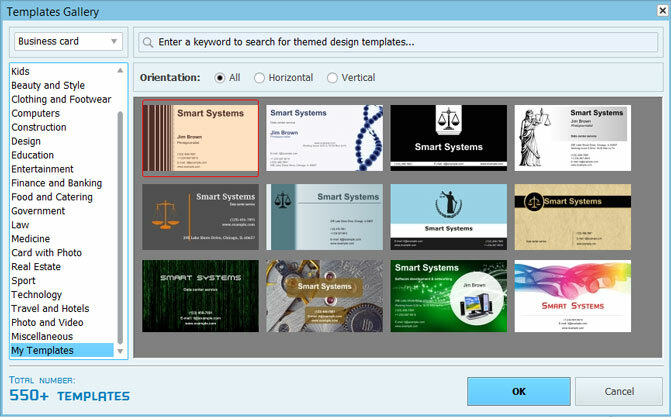 You can do it yourself if you use Business Card Maker, the best business card software in the market that is designed specifically for those who are not fond of losing time. The software has an intuitive interface and is packed with 550+ business card templates that can be easily customized. Read on to find the card style that will suit you best. If you are a lawyer who specializes in several fields or if you have your own law firm, you may make use of the classic designs. A card in such a style looks both conservative & serious, and it makes one think that its owner is a respectful and confident specialist. Experiment with the fonts and background colors, otherwise the card may look plain or bleak. Business Card Maker has a gallery of textures for the background, and you can try several before deciding upon the final variant. Modern designs are usually more diverse in colors and can be embellished with photographs. 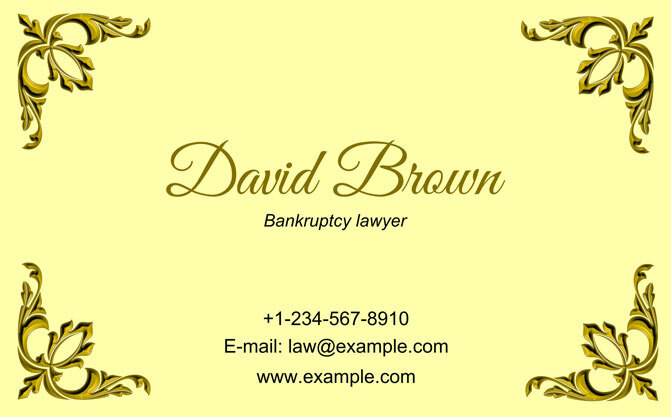 The lawyer's business card style presented below suits divorce consultants and business attorneys the best. The reason may surprise you – to work in these fields, you need to have not only nerves of steel, but sometimes even sense of humour or skills of a mediator. When we are in trouble, we want to surround us with people who can be innovative and sympathetic enough to help us out. So play with the font colors or set a photo as the background – this will cheer up anyone who looks for your help and is about to dial your number! Want to raise hopes and put strength in the hearts of the suffering ones? Use the universal language of symbols to add a conceptual meaning to your design. 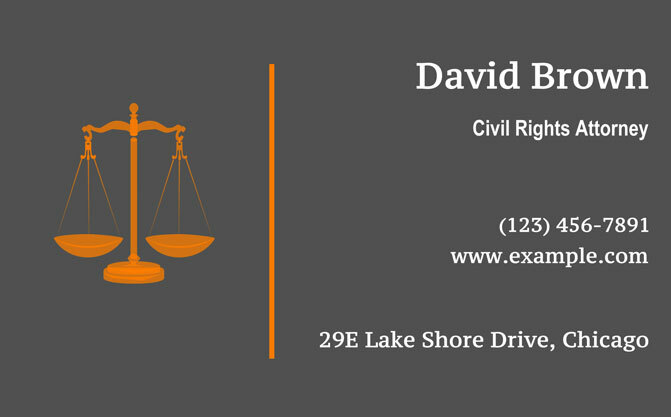 Lawyer's business cards can be adorned with such clipart emblems as Scales of Justice, Lady Justice or a Gavel. These images are recognizable all over the world and using them in your design is especially helpful if you deal with international law cases. Use the clipart gallery to choose the right symbol. You can move and resize it as you like. If your prime goal is to be recognizable so that people know your face, then you can add your own photo to the design. For instance, working as an in-house lawyer means meeting many people every day: complaining customers, questioning partners, colleagues with personal problems. You are a busy person, and they should be able to find you quickly to solve all the issues on the spot. Having a business card with a photo helps you to be the person whom one can easily notice in the crowd. Every time you meet a potential client you want to impress him or her with your skills and experience. As it is not always possible to have a small talk, sharing a business card with website, e-mail and phone number may be the only way to establish the connection. Your success as a lawyer depends largely on the impression you give. So don’t ruin it with badly designed business cards and create your own in a convincing and credible style!